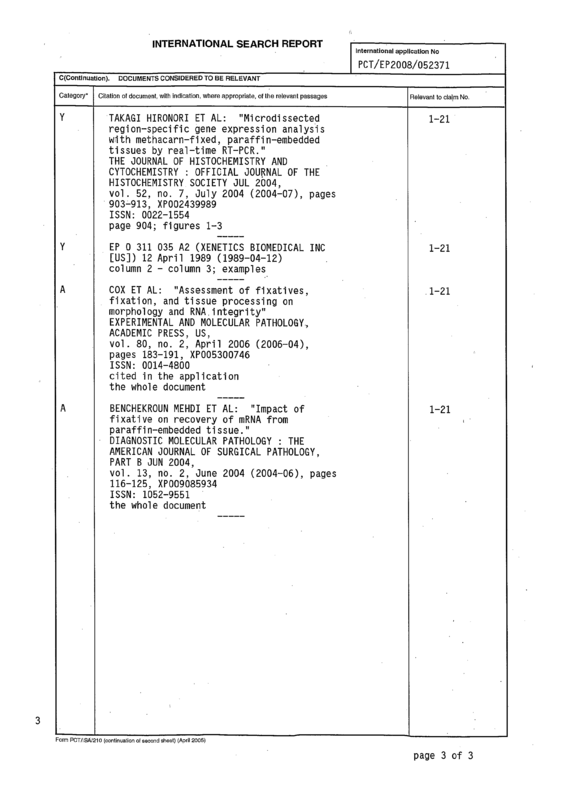 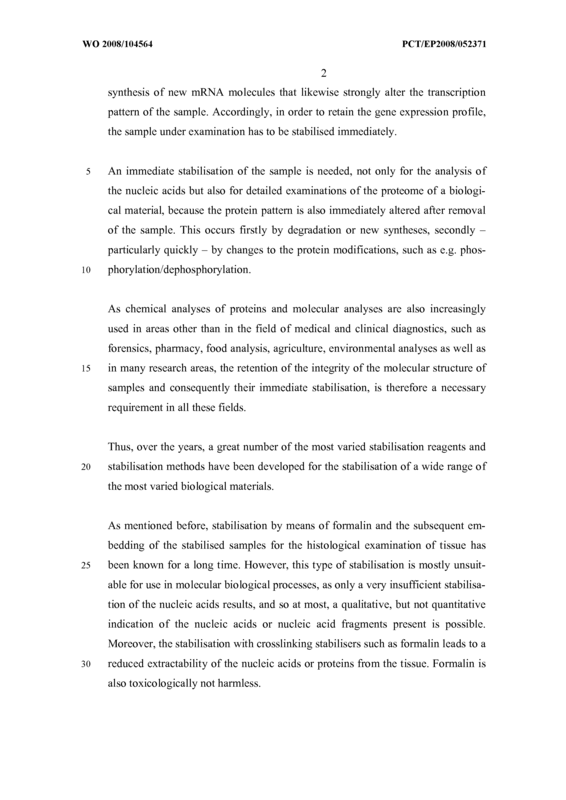 The present invention relates to a method for the treatment of a biological material, comprising the steps i) providing a biological material, and ii) contacting the biological material with a first non-aqueous composition comprising: (a1) 10 to 90 vol.% methanol, and (a2) at least one additional additive, and (a3) optionally an acid. 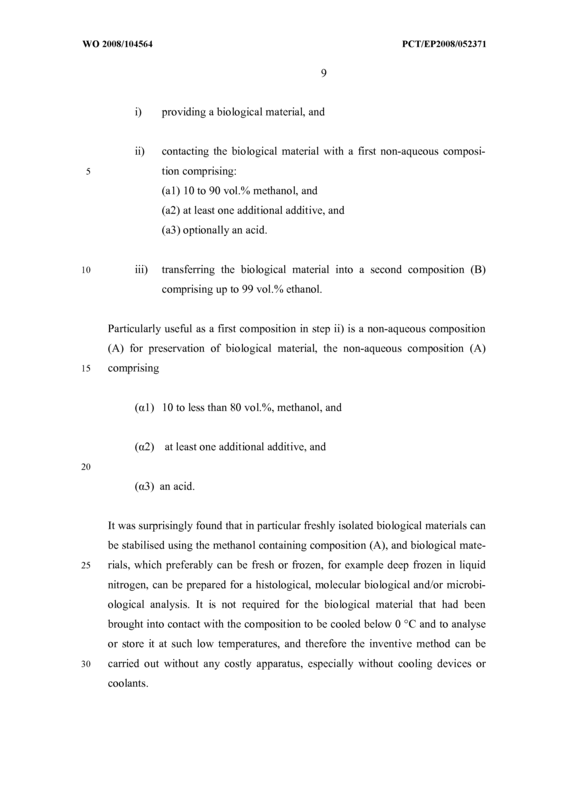 iii) transferring the biological material into a second composition (B) comprising up to 99 vol.% ethanol as well as to a new composition for preservation of a biological material usable in said method and the biological material resulting from this method, a method for the analysis of a treated biological material, various kits as well as the use of the composition in such a method. 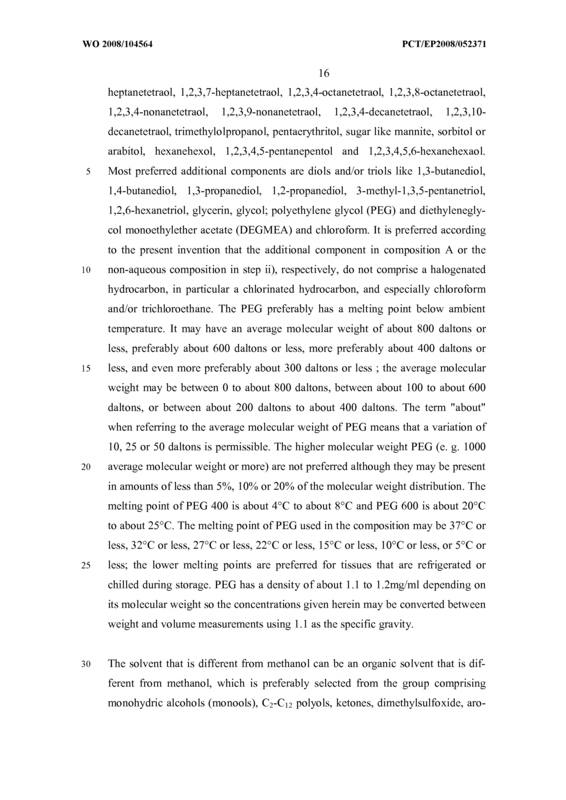 (a2) at least one additional additive, and (a3) optionally an acid. 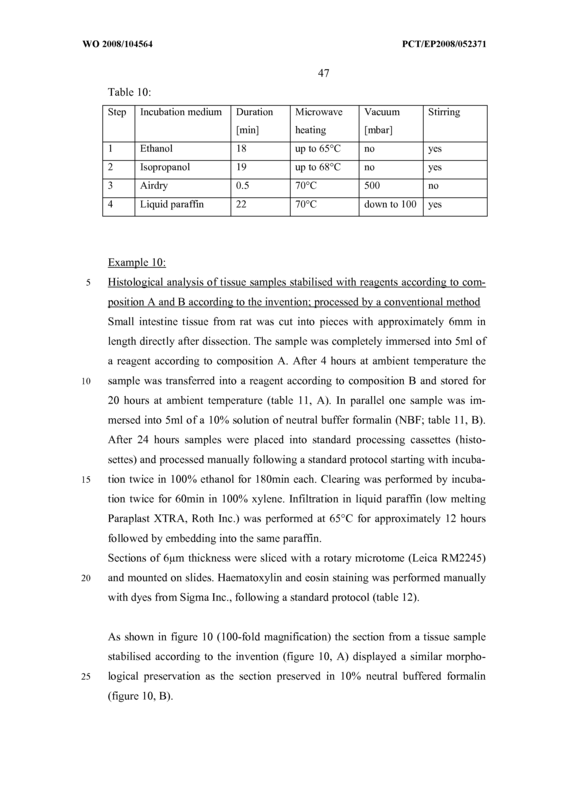 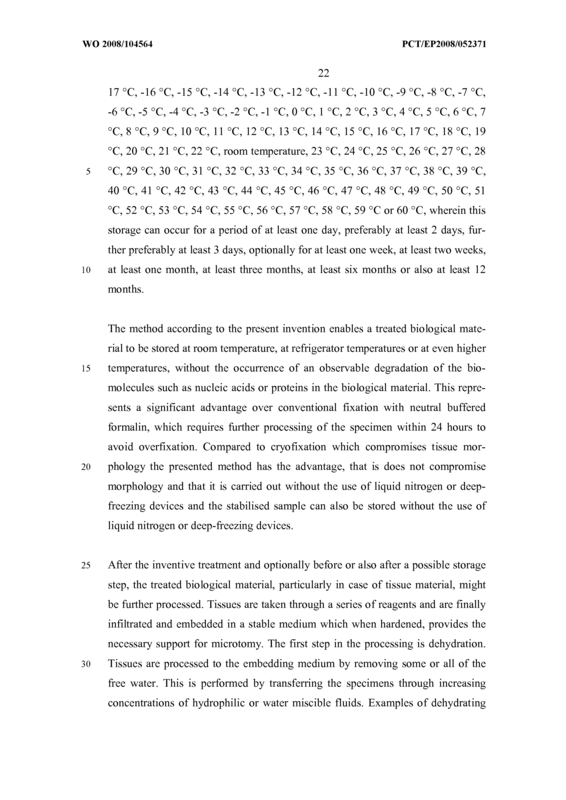 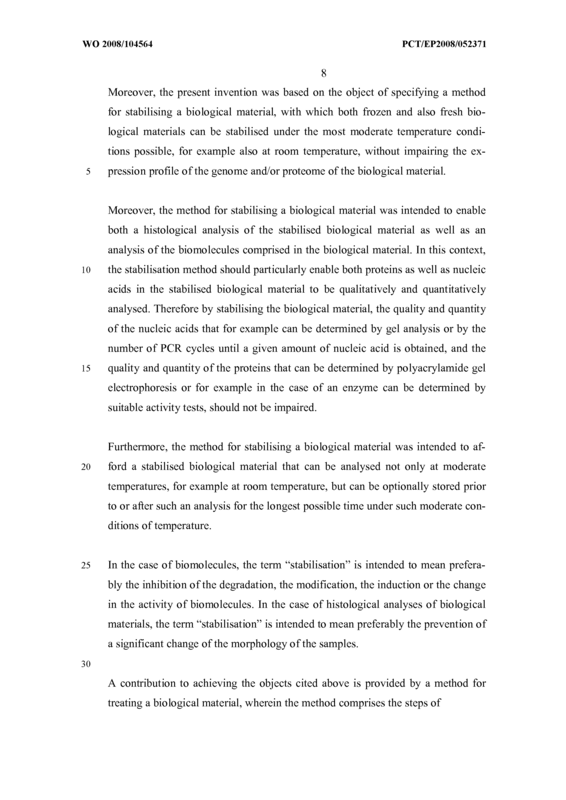 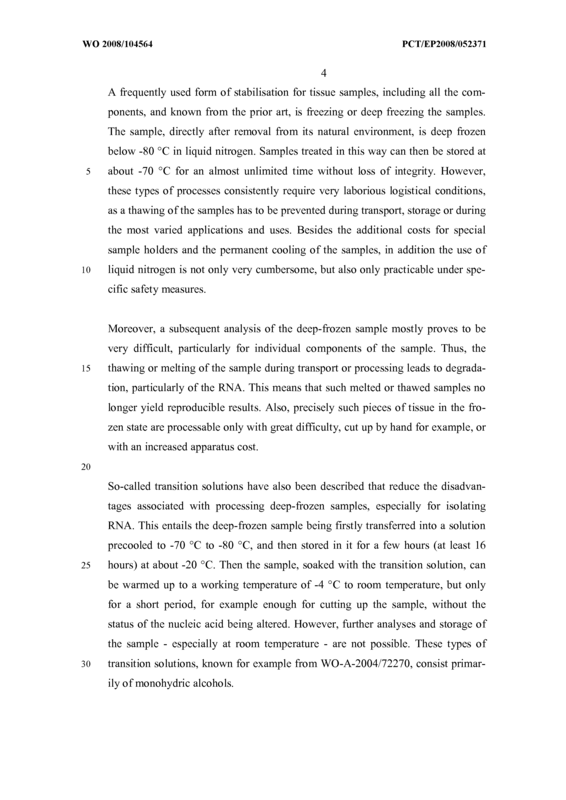 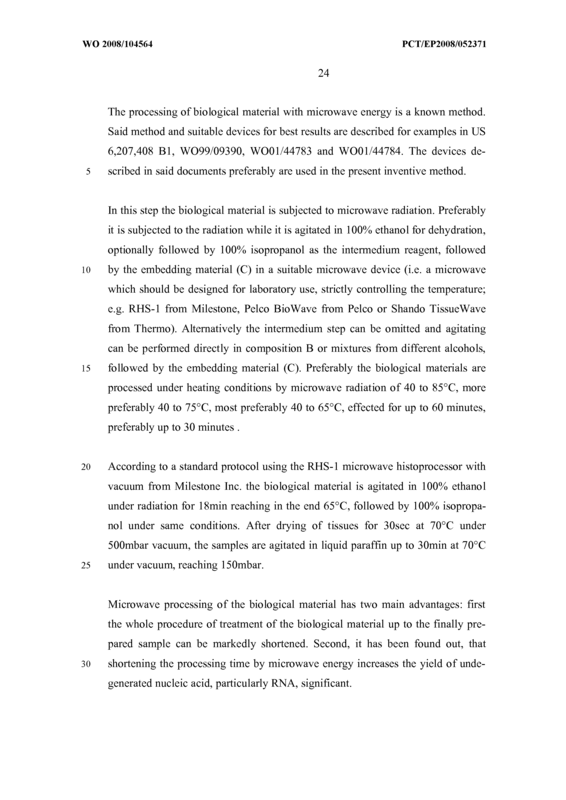 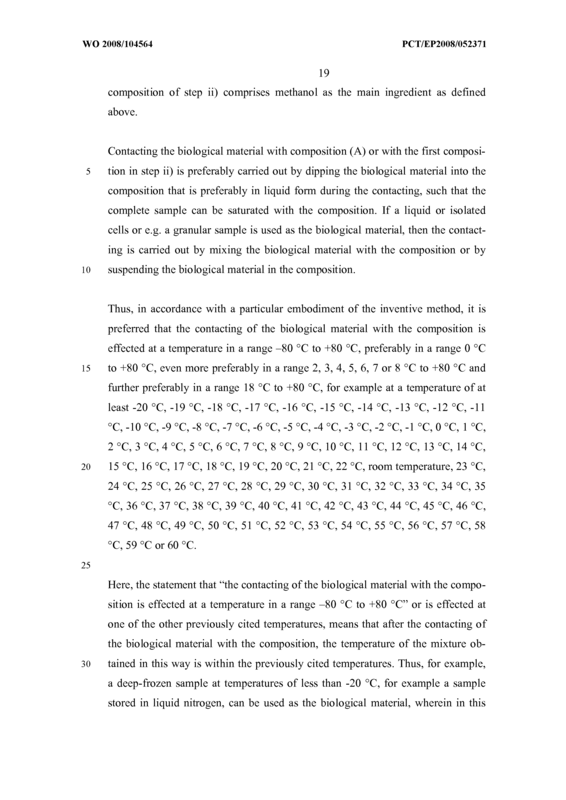 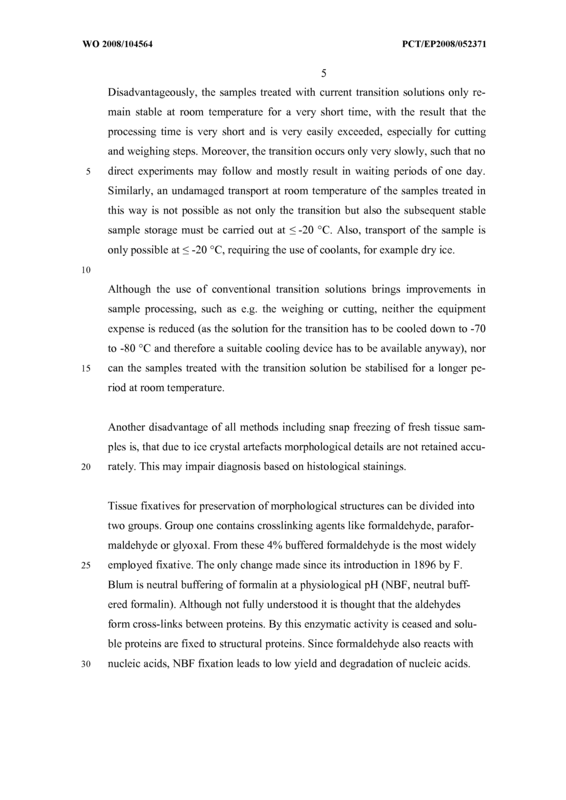 Method according to claim 1, wherein the contacting of the biological material with the composition(s) is effected at a temperature in a range -80 0C to +80 0C. 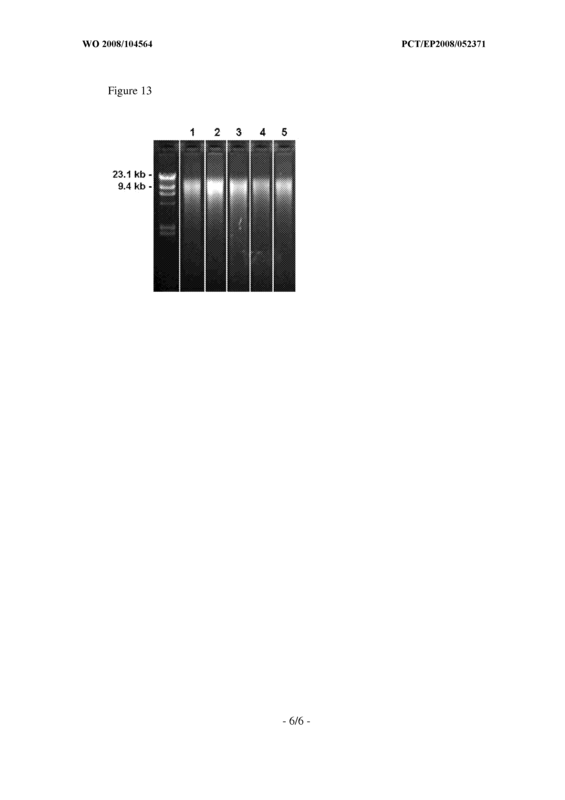 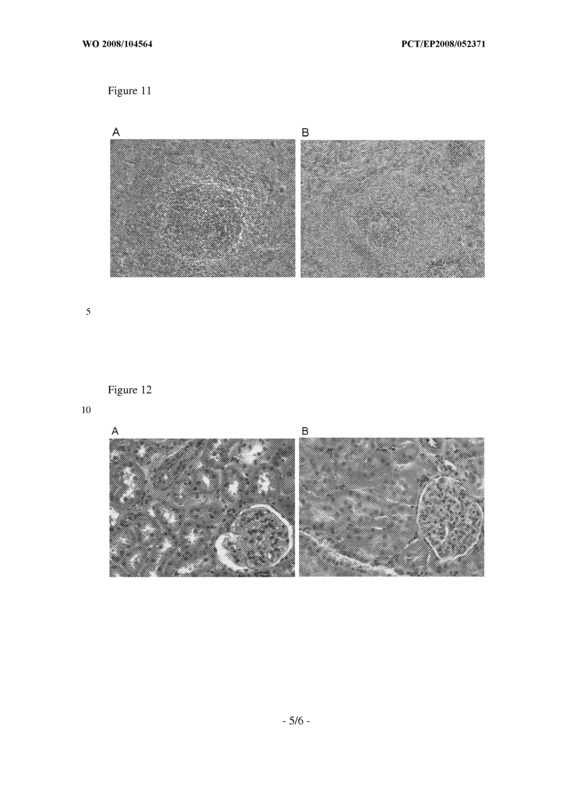 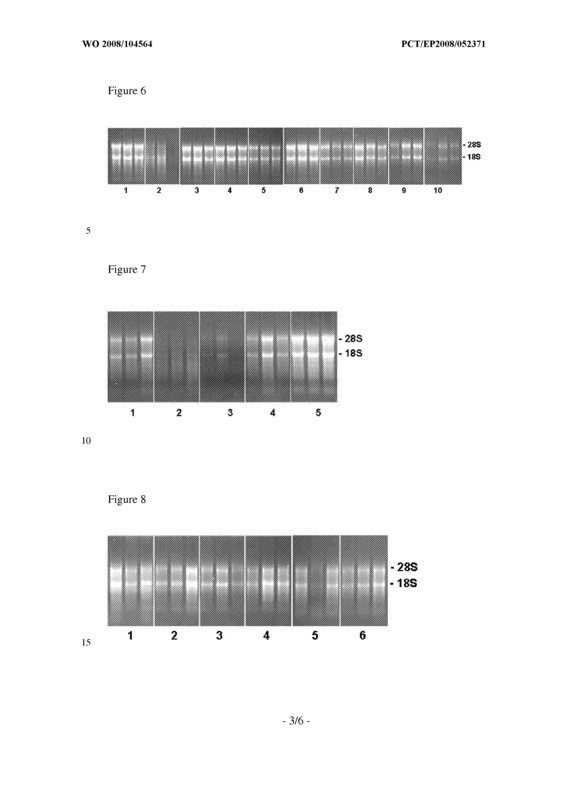 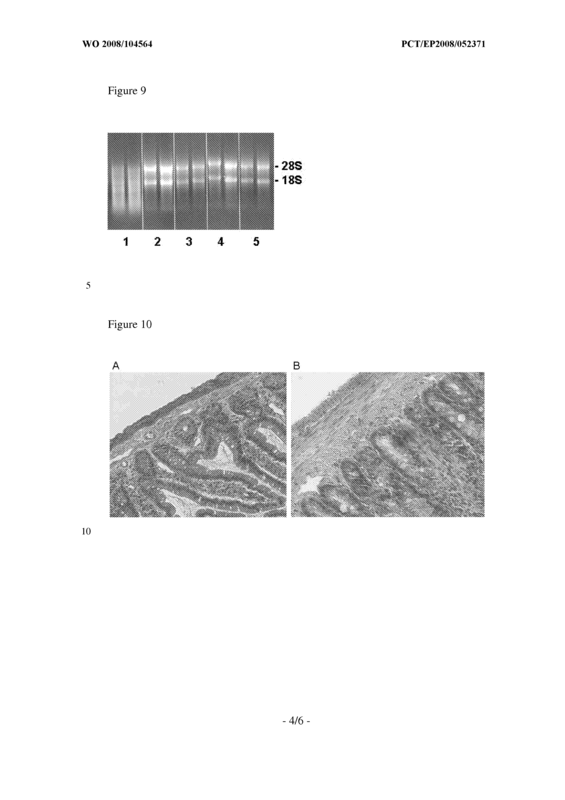 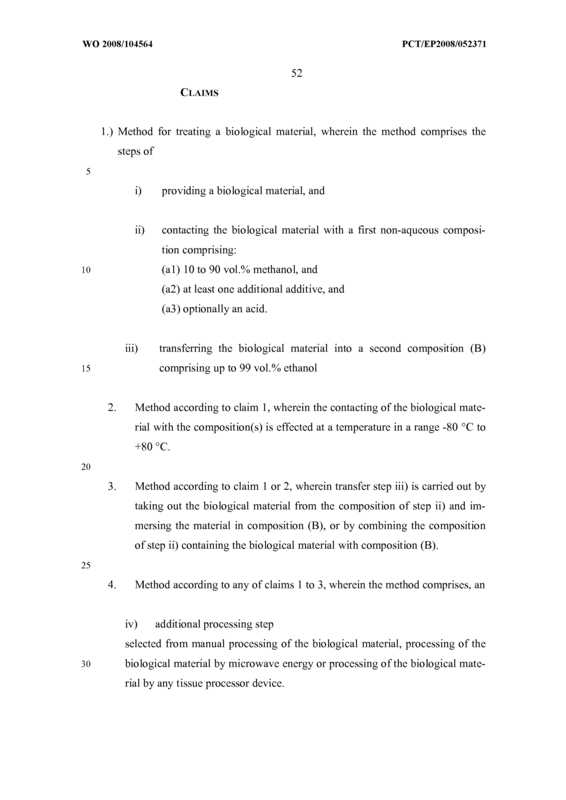 Method according to claim 1 or 2, wherein transfer step iii) is carried out by taking out the biological material from the composition of step ii) and immersing the material in composition (B), or by combining the composition of step ii) containing the biological material with composition (B). 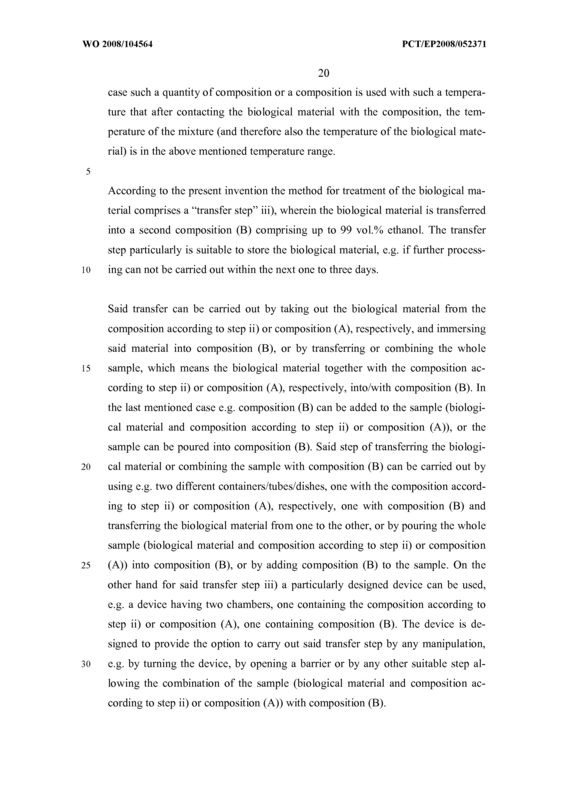 iv) additional processing step selected from manual processing of the biological material, processing of the biological material by microwave energy or processing of the biological material by any tissue processor device. 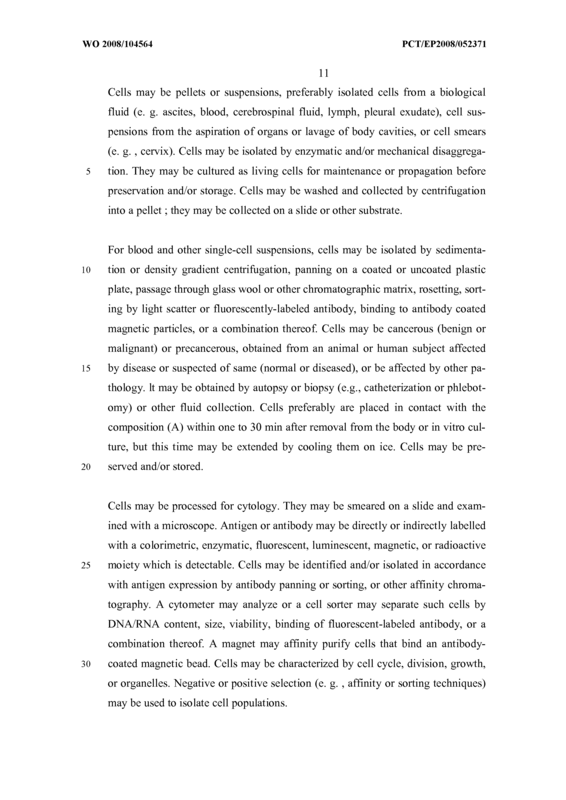 Method according to any of claims 1 to 4, wherein the biological material comprises cells or tissue. 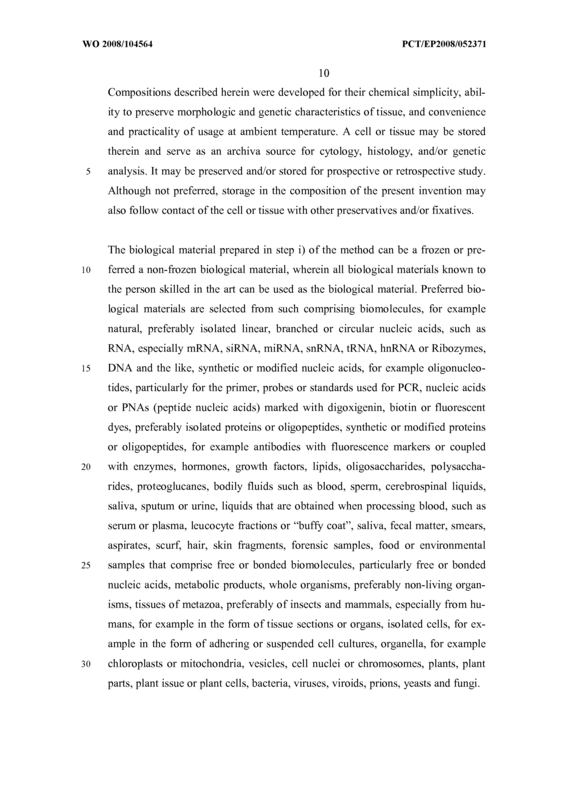 Method according to claim 5, wherein the biological material contains organisms, isolated cells, organella, bacteria, fungi or parts of fungi, viruses, viroids, prions, tissue, tissue fragments, tissue sections, body fluids, natural, optionally isolated proteins, synthetic or modified proteins, natural, optionally isolated nucleic acids, synthetic or modified nucleic acids, other bio- molecules such as, lipids, carbohydrates, metabolic products and metabo- lites, plants or parts of plants, faecal matter, swabs, aspirates, food samples, environmental samples, forensic samples. 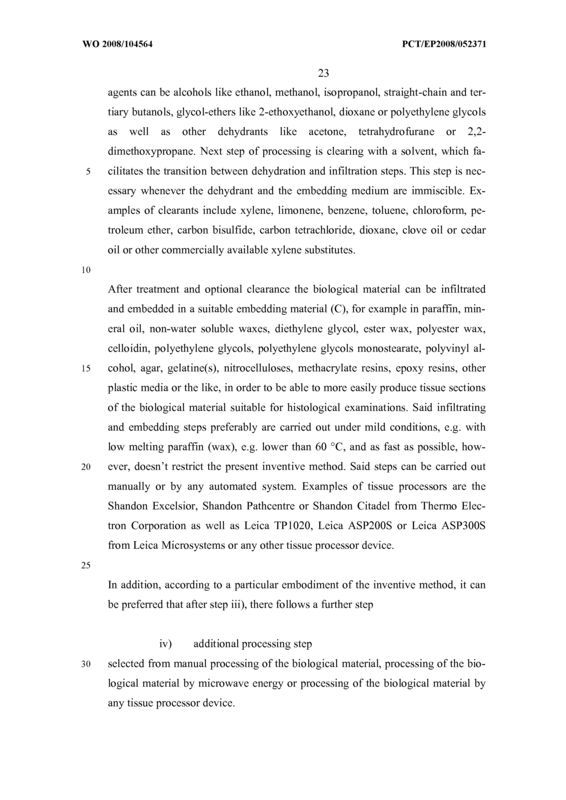 Method according to any of claims 1 to 6, further comprising : infiltration and/or embedding the material after step iii) in an embedding material (C), preferably selected from paraffin, mineral oil, non- water soluble waxes, cel- loidin, polyethylene glycols, polyvinyl alcohol, agar, gelatine, nitrocellu- loses, methacrylate resins, epoxy resins, or other plastic media. 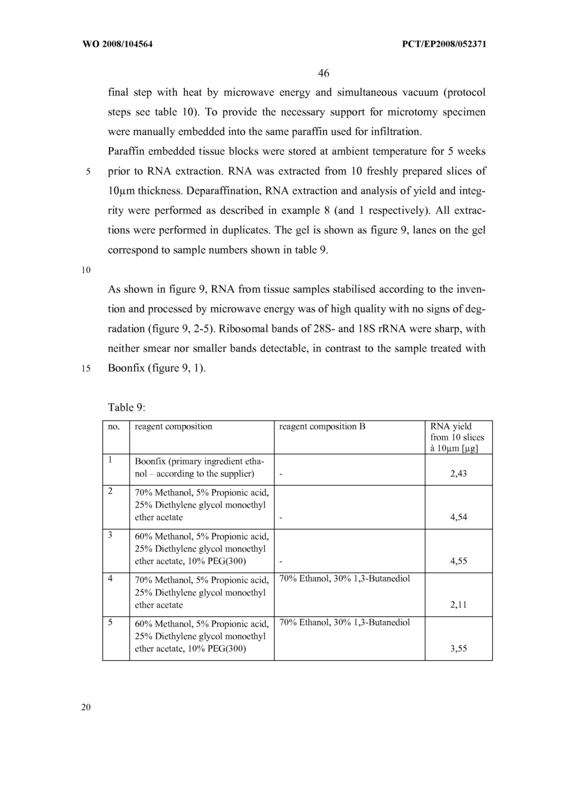 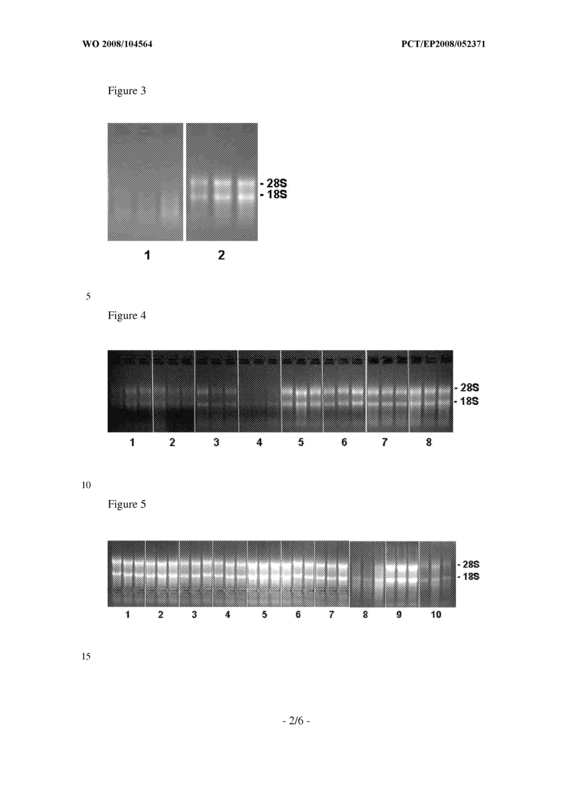 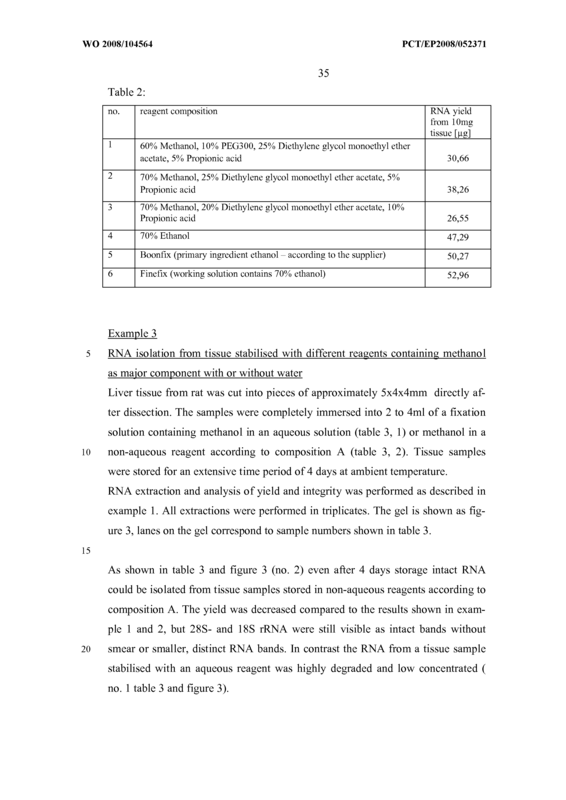 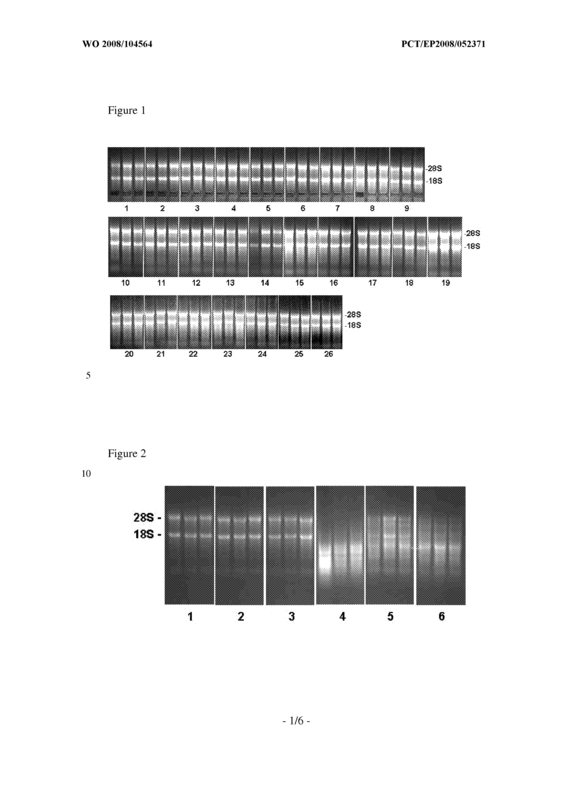 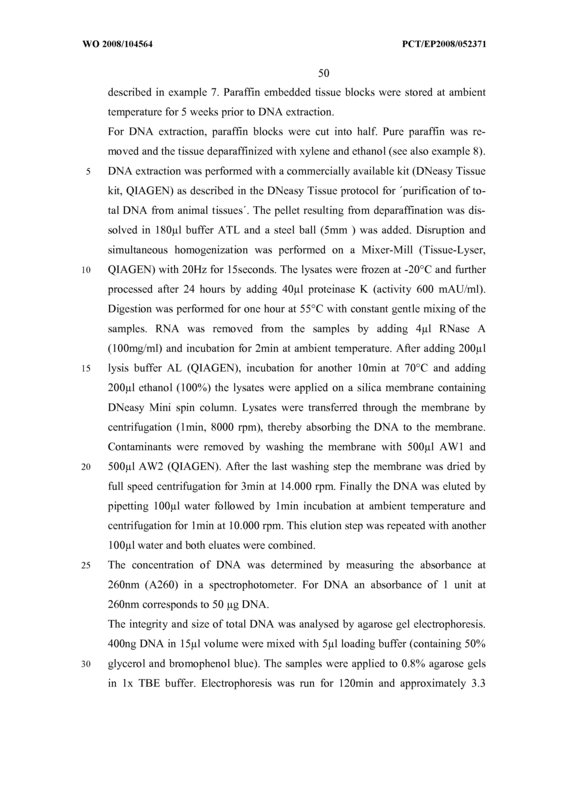 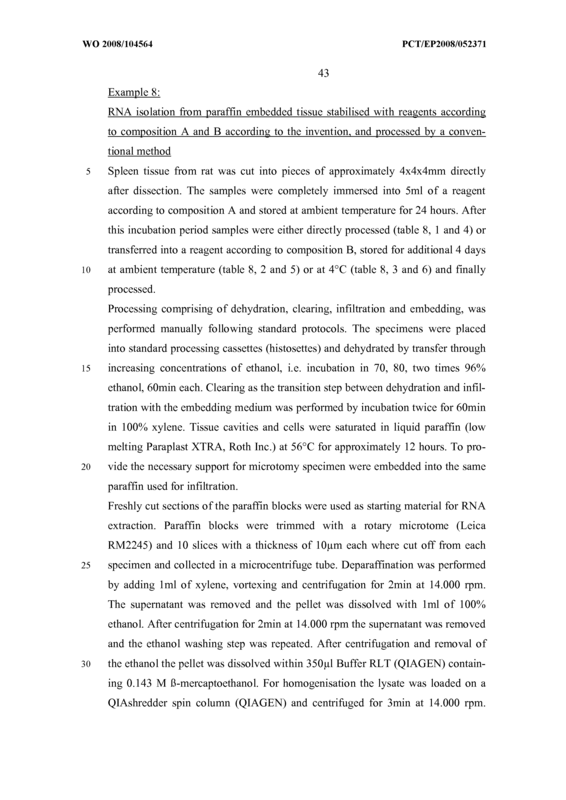 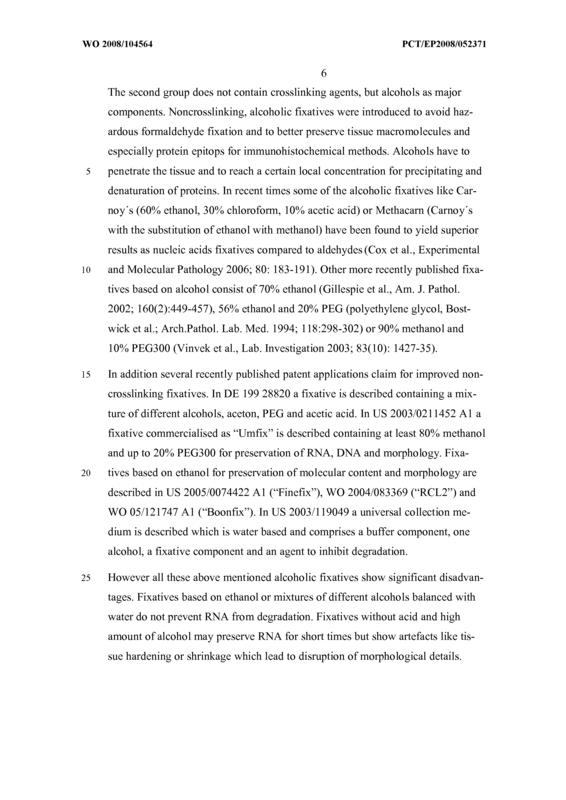 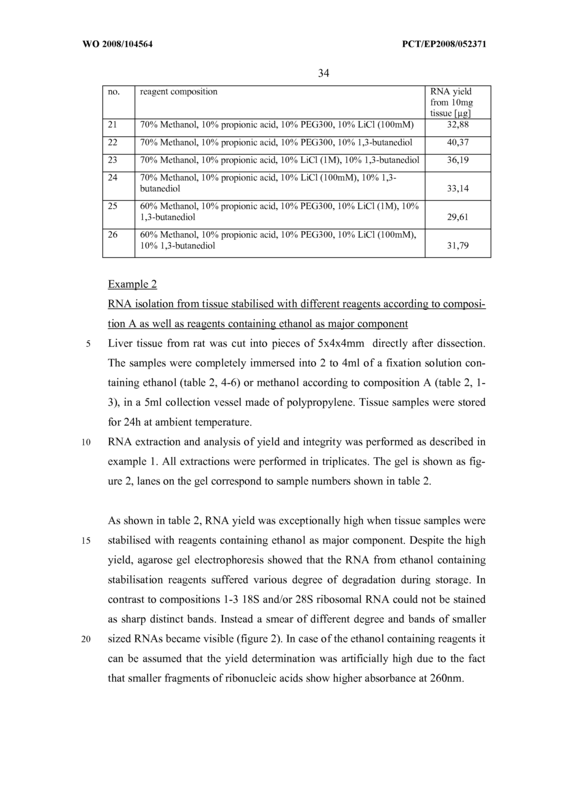 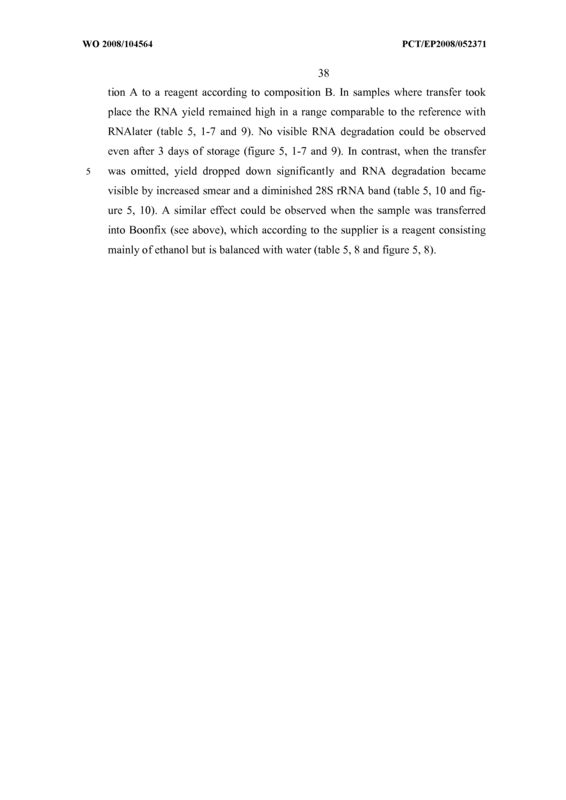 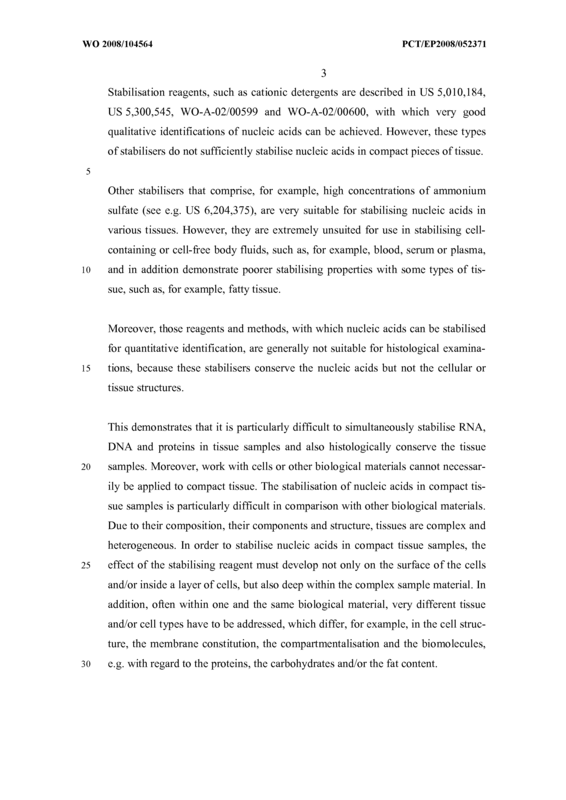 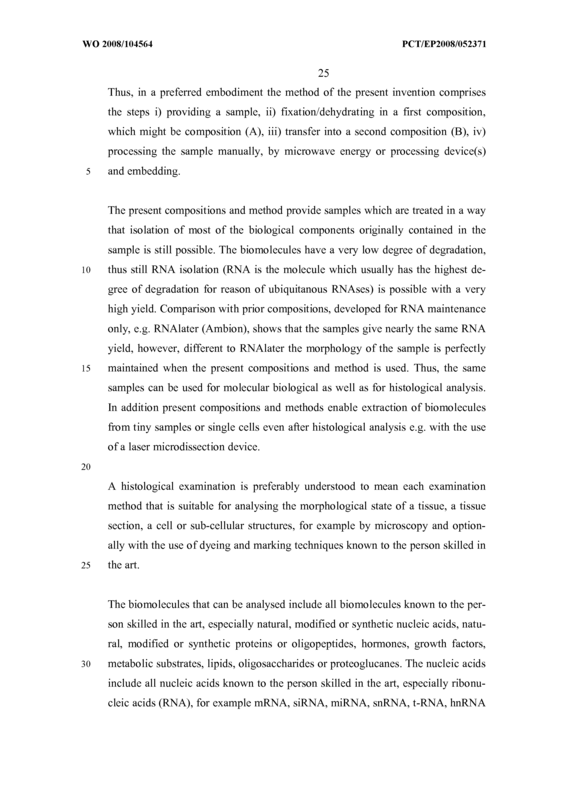 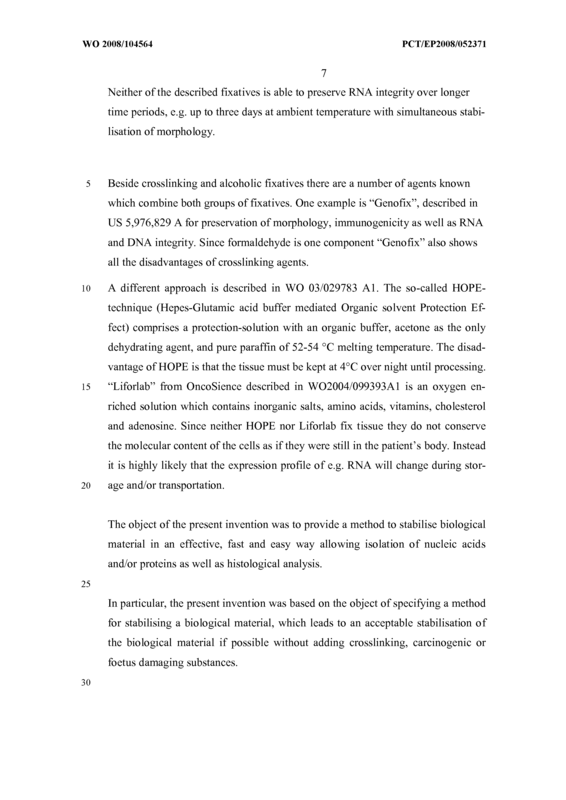 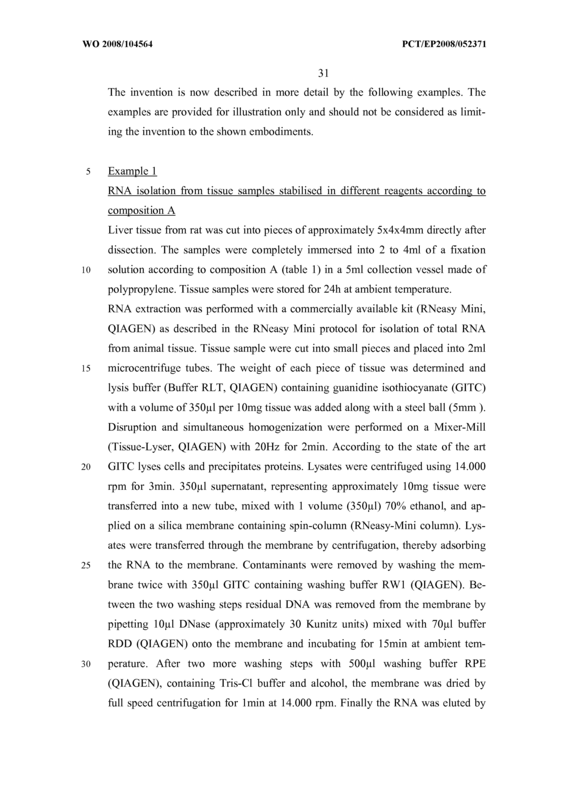 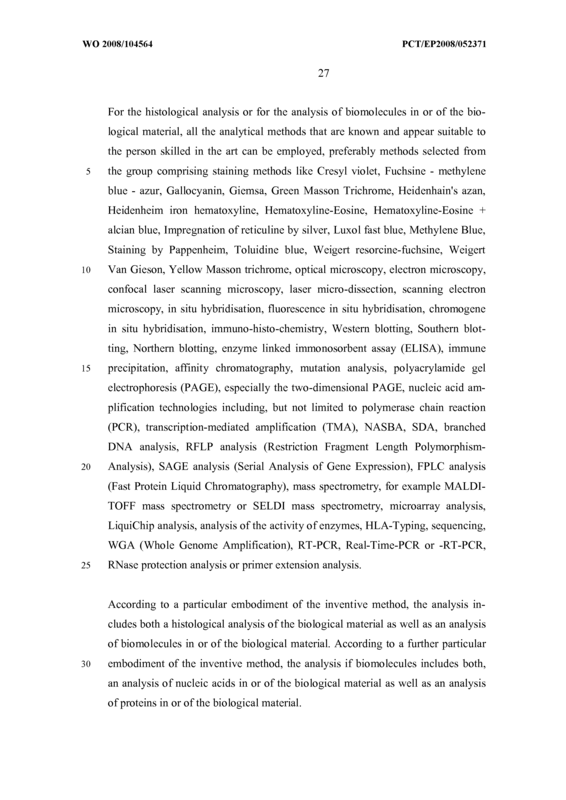 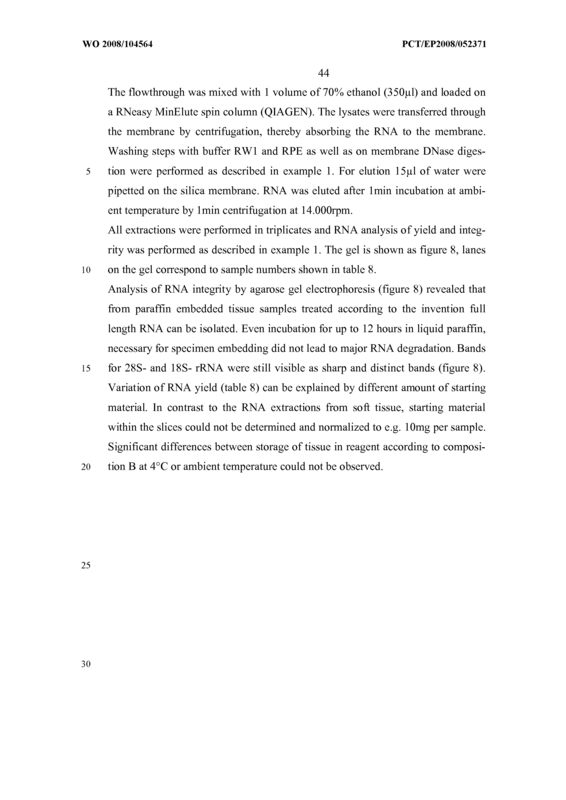 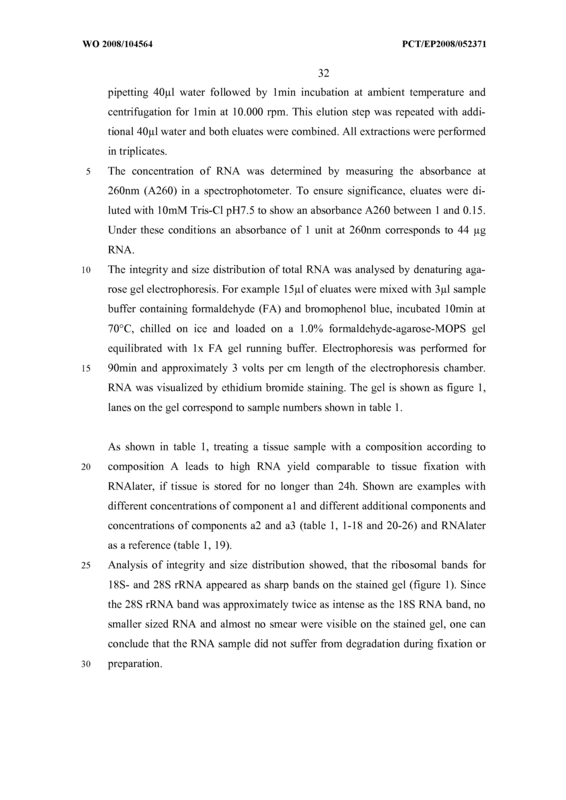 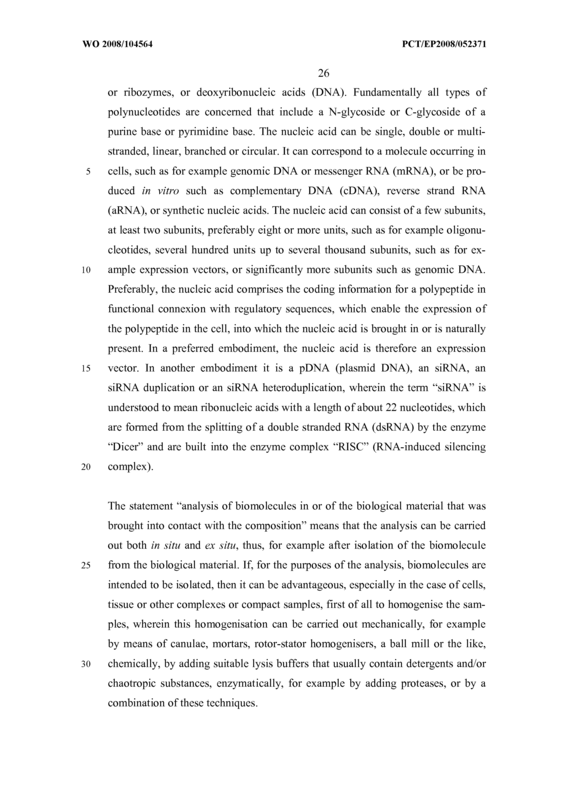 Method according to any of claims 1 to 7, further comprising : storing the treated biological material, isolation of at least one of the biological components originally contained in the sample, analysis of at least one of the biological components in or of the biological material, wherein the biological components comprise nucleic acids, proteins, peptides and/or peptide nucleic acids, and/or histological analysis of the biological material in particular comprising staining, microscopy, dissection, hybridisation and/or immuno-histo chemis- try. 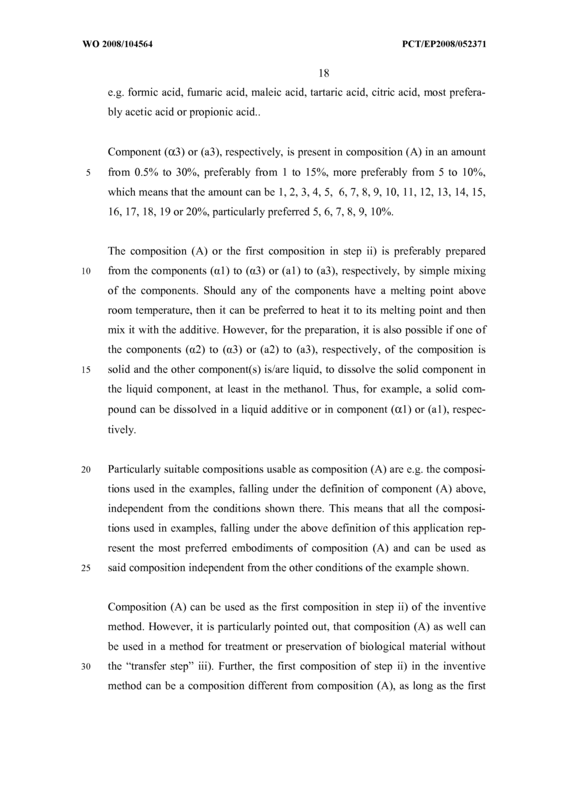 Composition according to claim 9, wherein component (αl) is present in an amount of 20 % to less than 80 vol.%, preferably from 30 to less than 80% and most preferably from 50 to less than 80 vol.%. 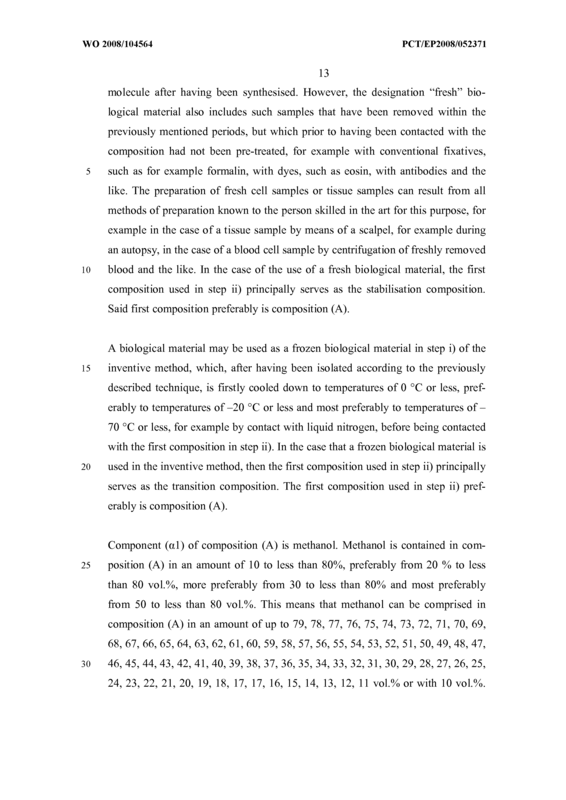 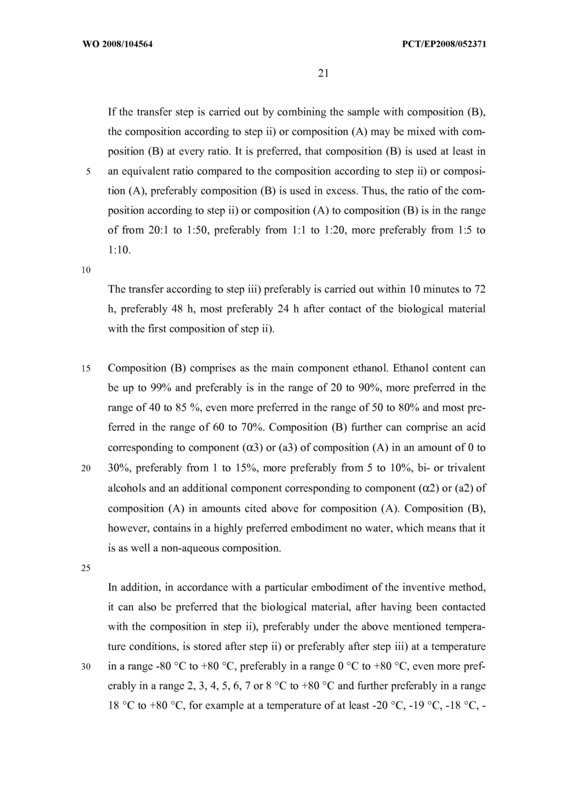 Composition according to claims 9 or 10 or method according to any of claims 1 to 8, wherein component (cc2) or (a2) is present in an amount of 1 to 50 %. 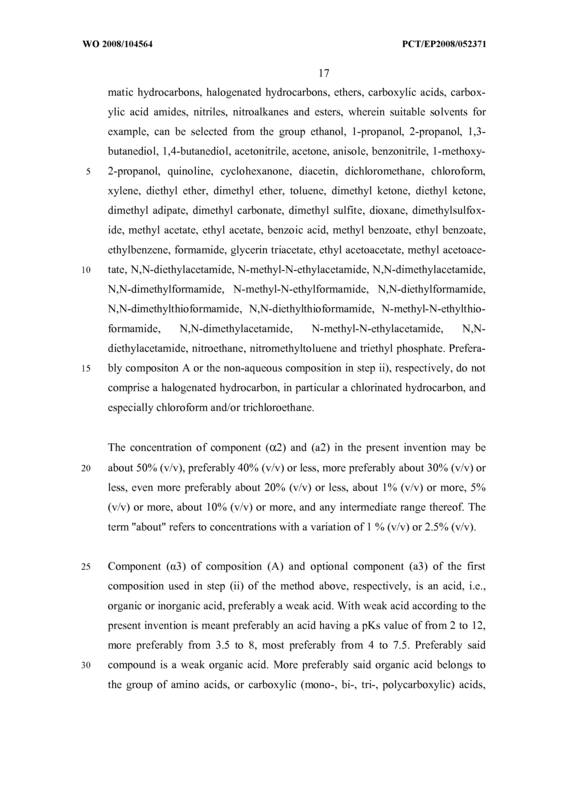 Composition or method according to any of claims 1 to 11, wherein component (cc3) or (a3) is at least one organic acid, preferably a weak organic acid, more preferably selected from formic acid, acetic acid and propionic acid or mixture thereof. 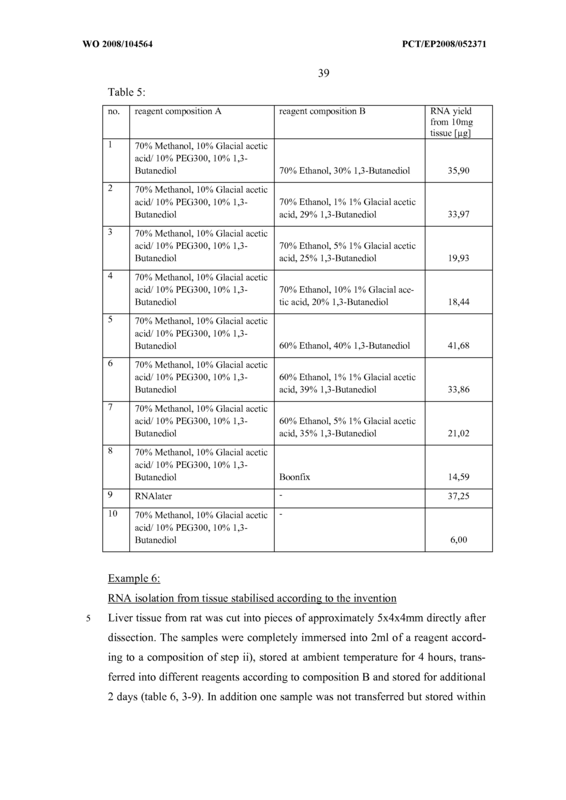 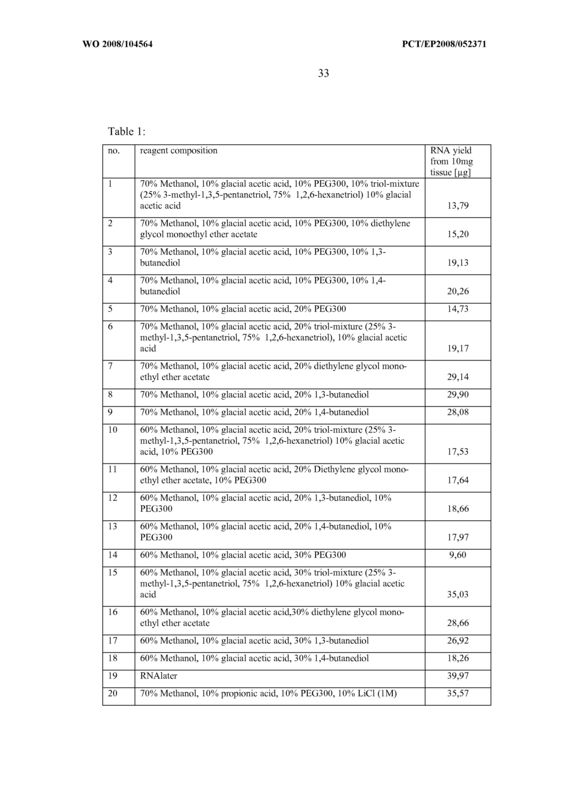 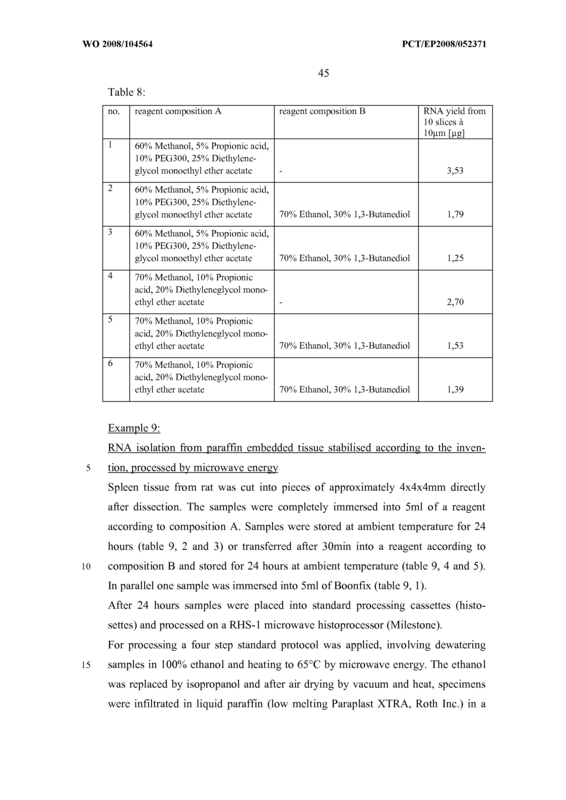 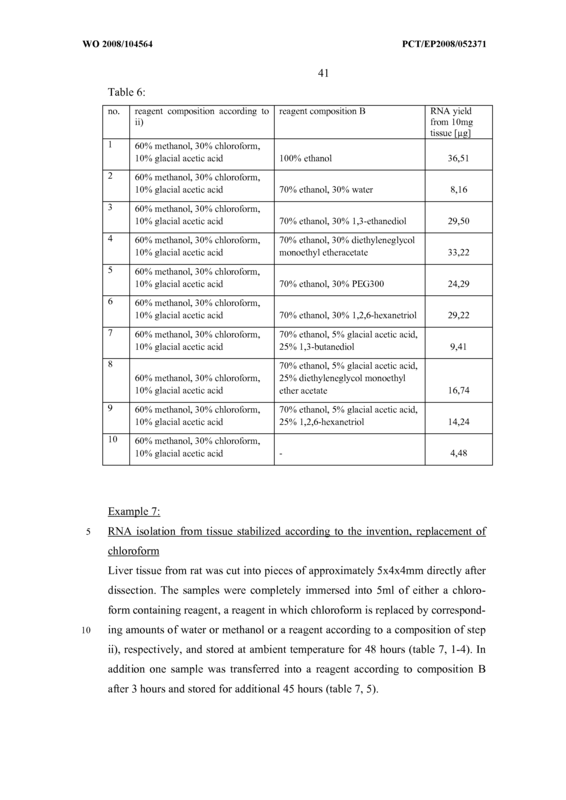 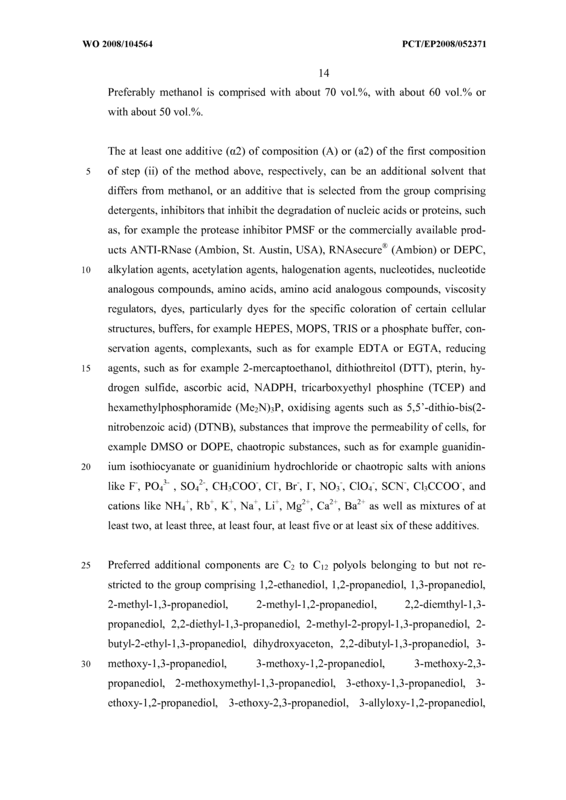 Composition or method according to claim 13, wherein component (cc2) or (a2) is selected from C2 to Ci2 polyols, particularly diols and/or trio Is like 1,3-butanediol, 1 ,4-butanediol, 1,3 -propanediol, 1,2- propanediol, 3-methyl-l,3,5-pentanetriol, 1,2,6-hexanetriol, glycerine, gly- col; PEG and DEGMEA. 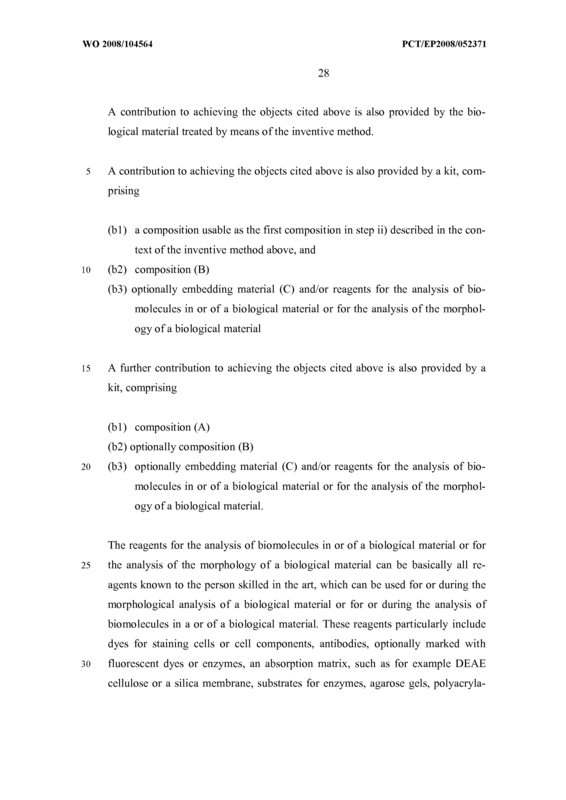 (b3) optionally embedding material (C) and/or reagents for the analysis of biomolecules in or of a biological material or for the analysis of the morphology of a biological material. 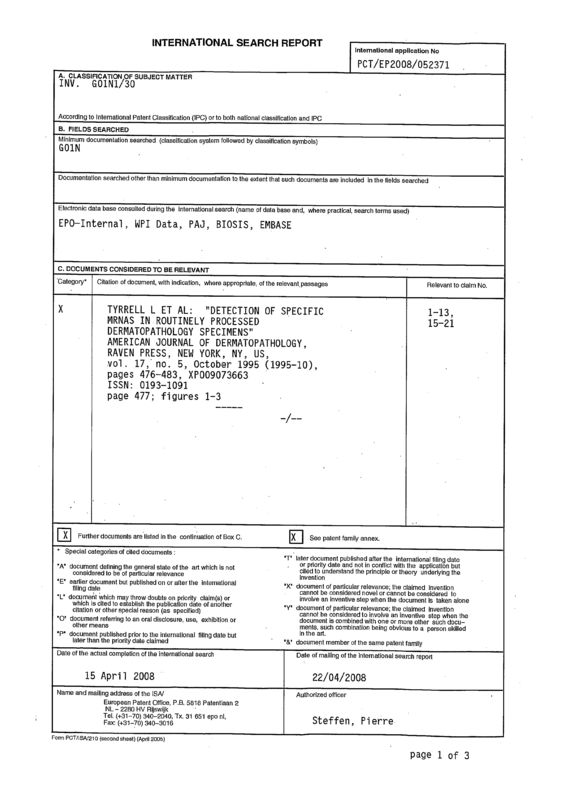 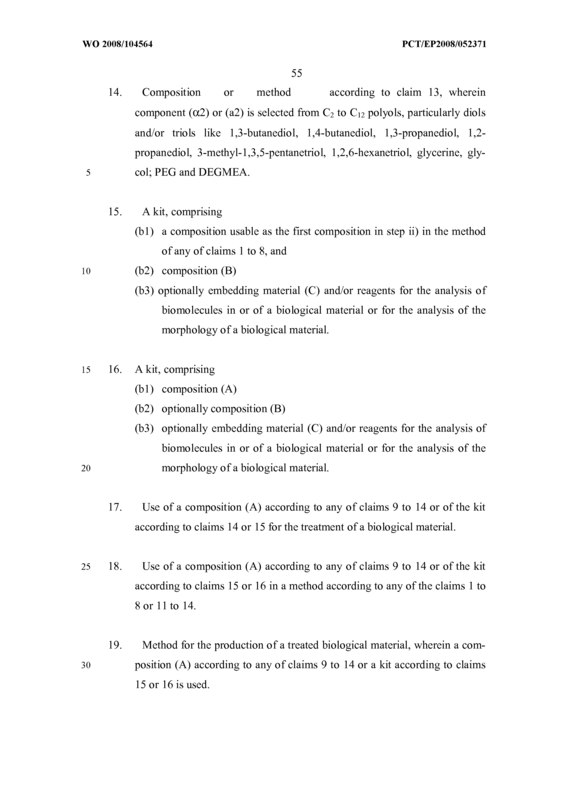 Use of a composition (A) according to any of claims 9 to 14 or of the kit according to claims 14 or 15 for the treatment of a biological material. 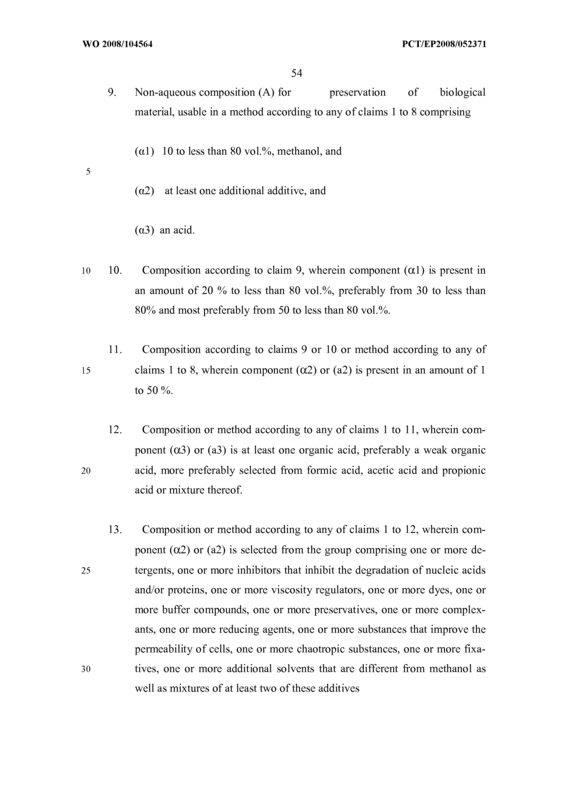 Use of a composition (A) according to any of claims 9 to 14 or of the kit according to claims 15 or 16 in a method according to any of the claims 1 to 8 or 11 to 14. 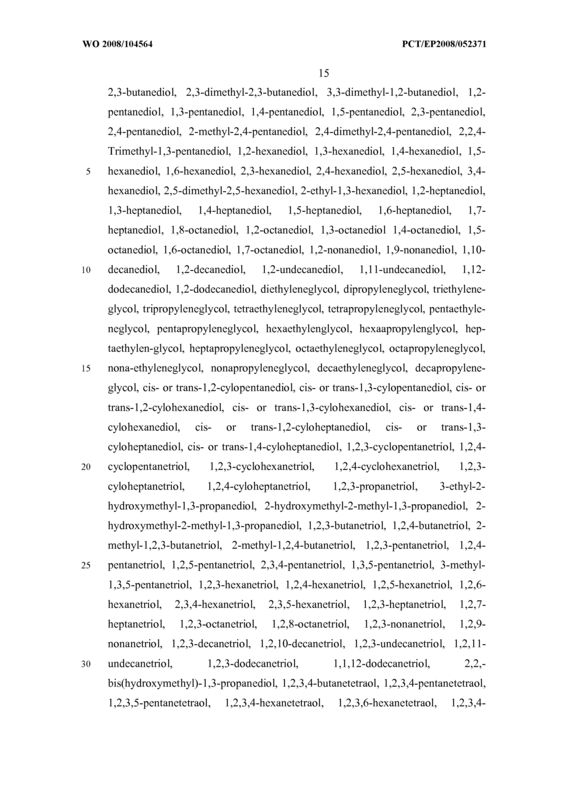 15 or 16 is used. 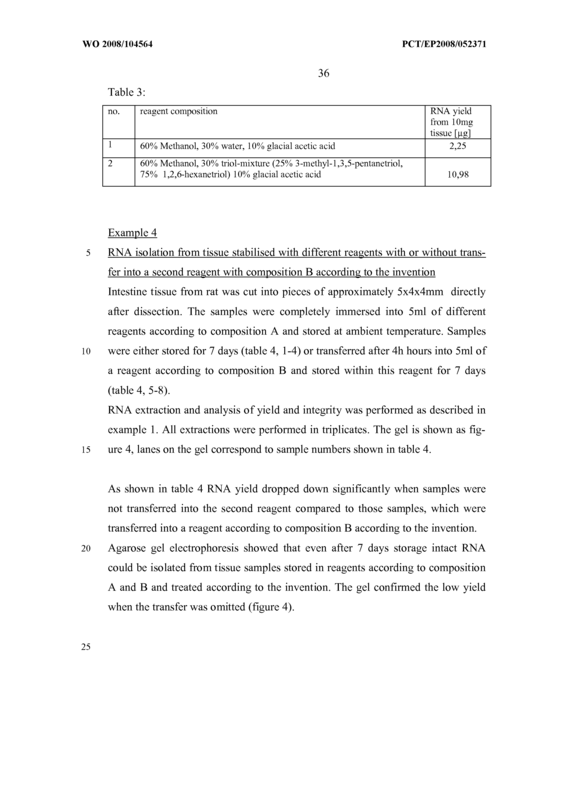 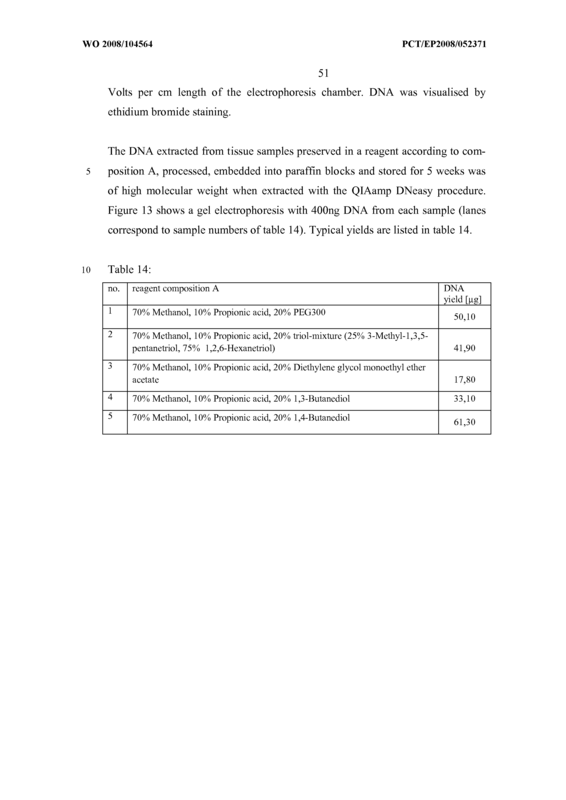 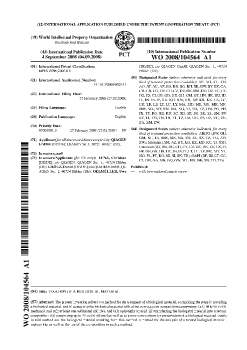 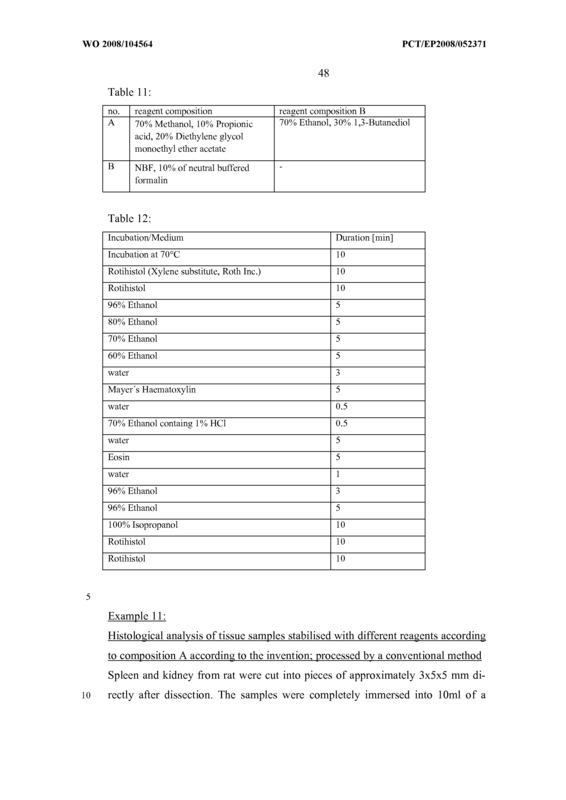 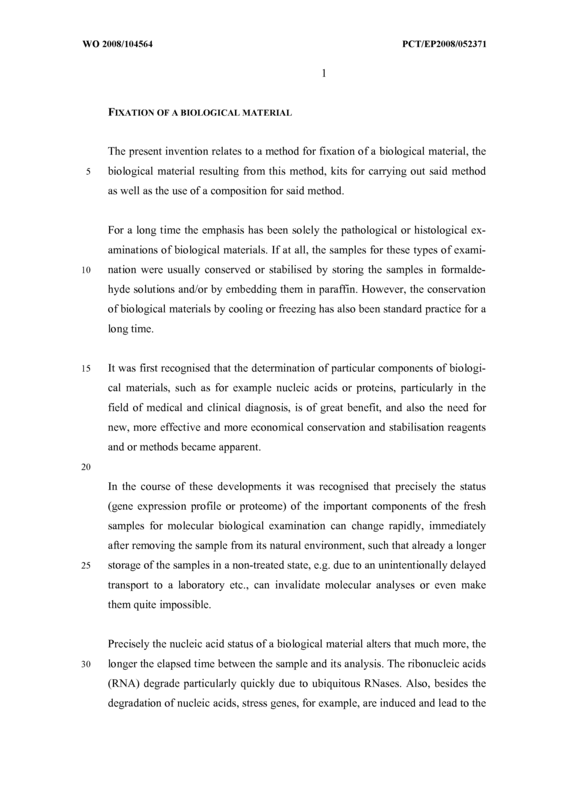 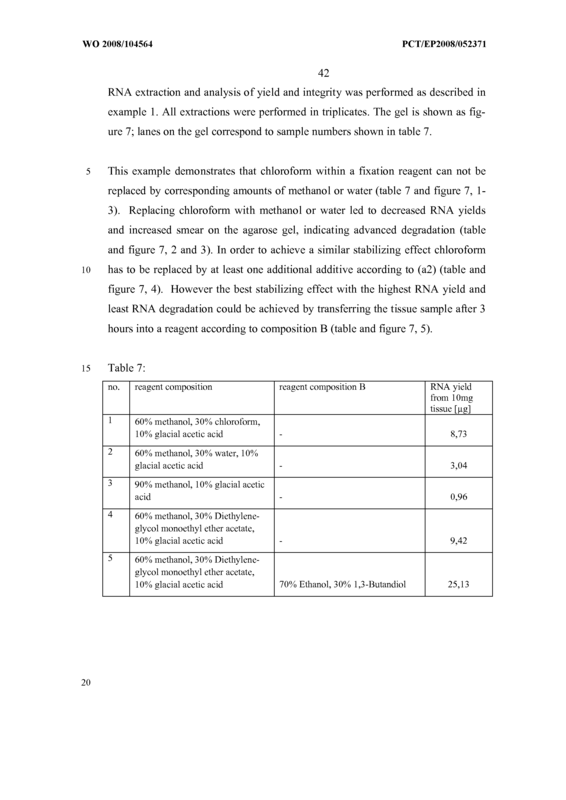 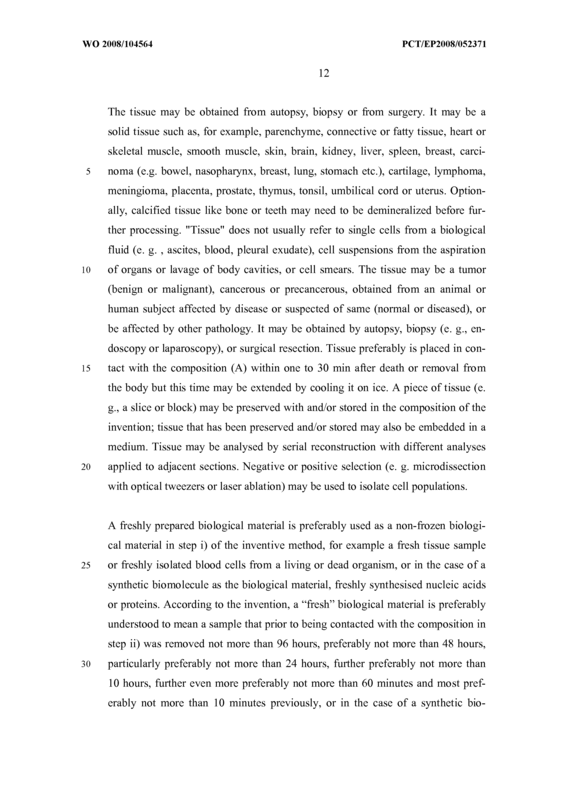 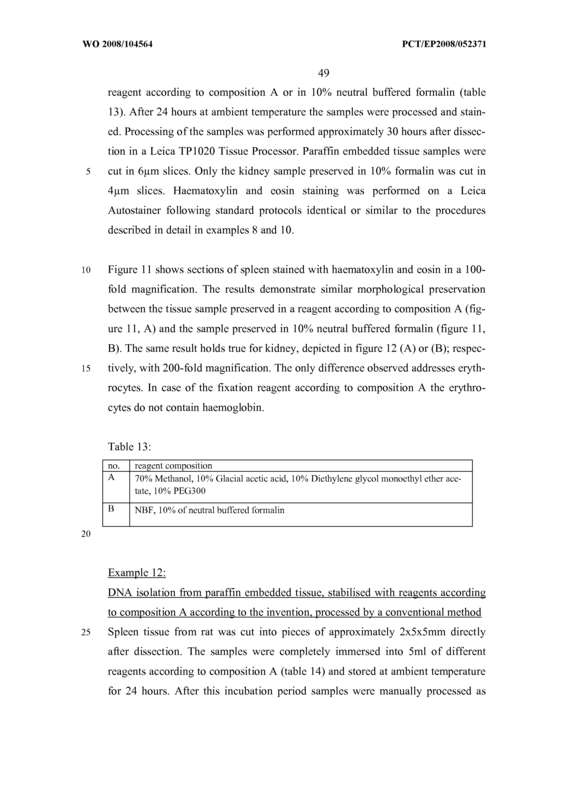 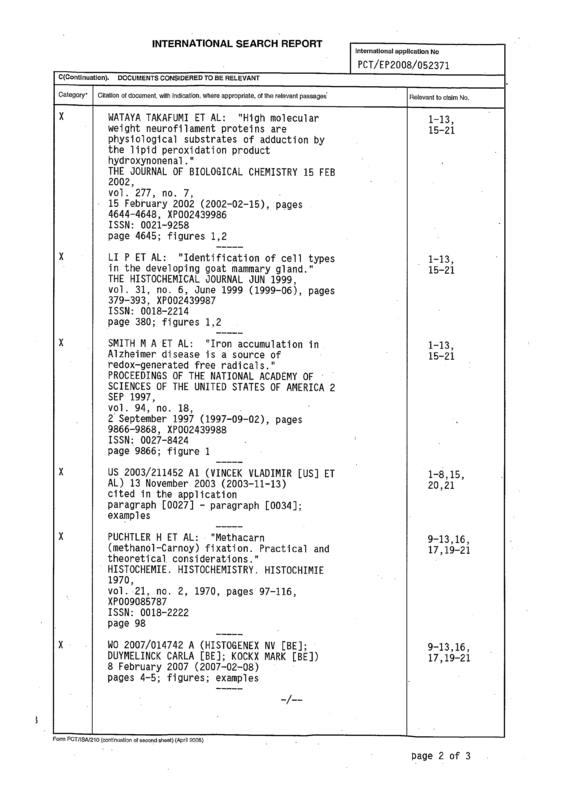 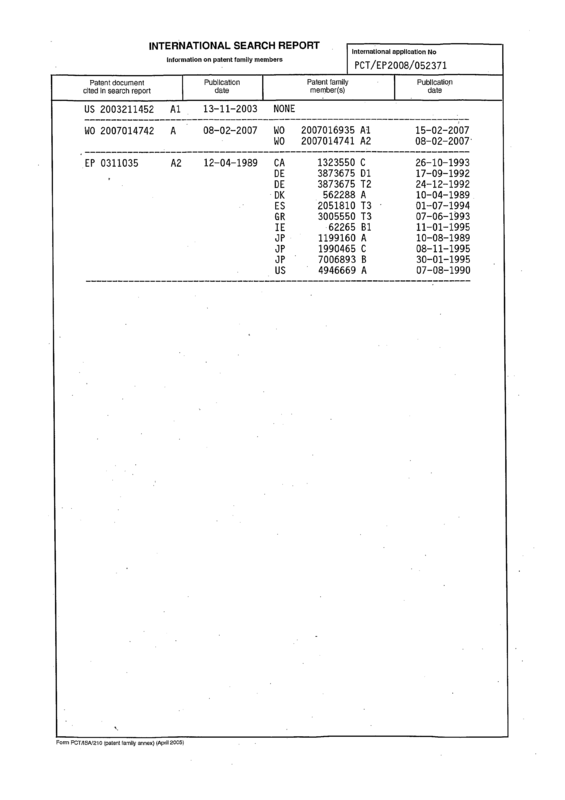 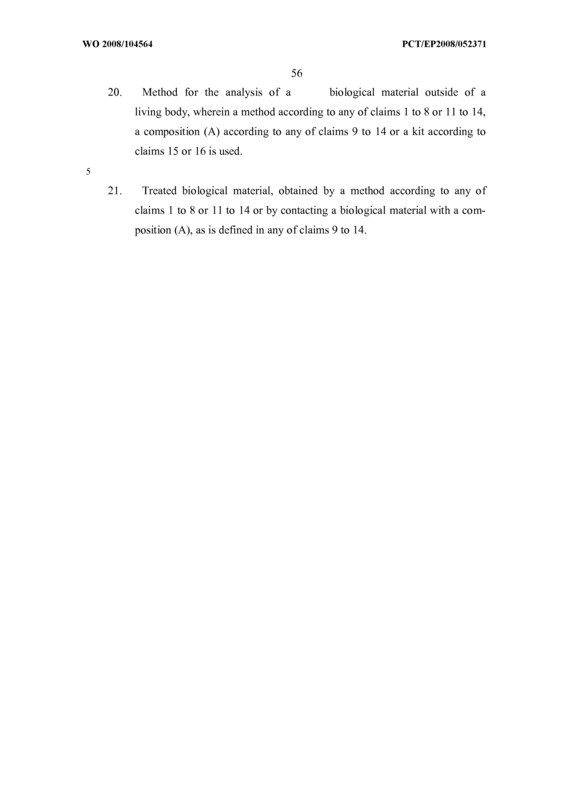 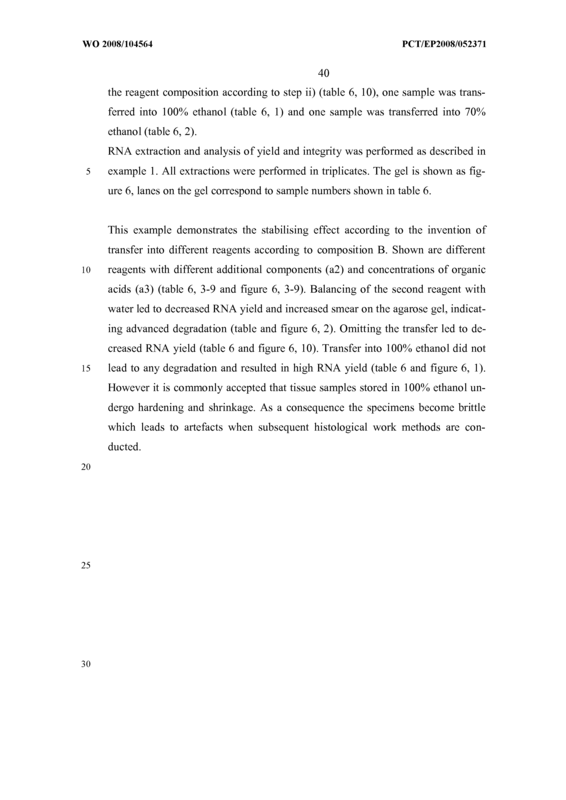 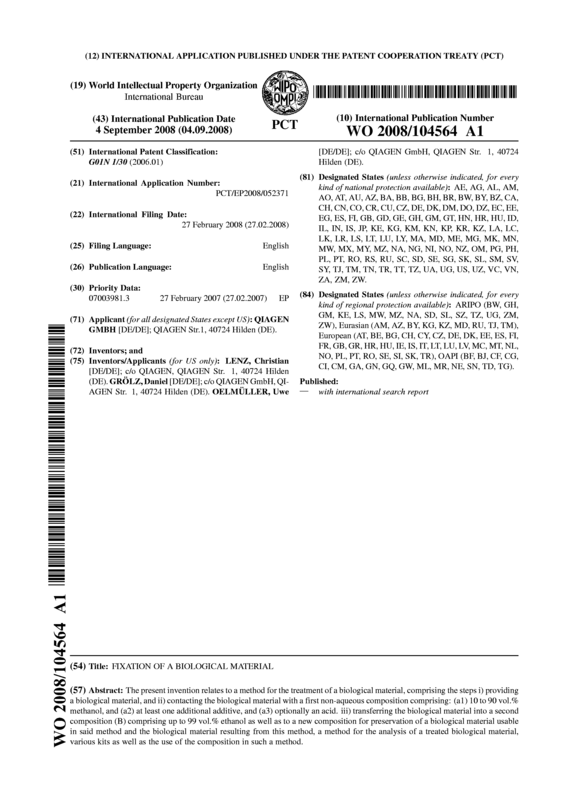 Method for the analysis of a biological material outside of a living body, wherein a method according to any of claims 1 to 8 or 11 to 14, a composition (A) according to any of claims 9 to 14 or a kit according to claims 15 or 16 is used. 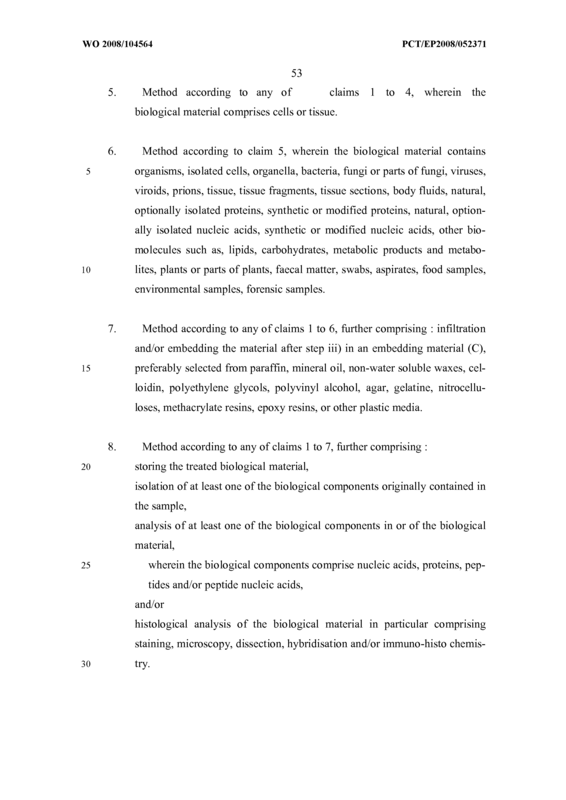 Treated biological material, obtained by a method according to any of claims 1 to 8 or 11 to 14 or by contacting a biological material with a composition (A), as is defined in any of claims 9 to 14.